GreatGold.fm – Changes are a fact of life. In an attempt to bring you up to date with the current situation at GreatGold.fm Internet Radio, we’re jotting down a few words. First, we are no longer with Radionomy. The past, nearly one year experiment, found the association not to the benefit of both parties. As a result, our streaming server has changed back to the McStreamy.net Streaming Service. 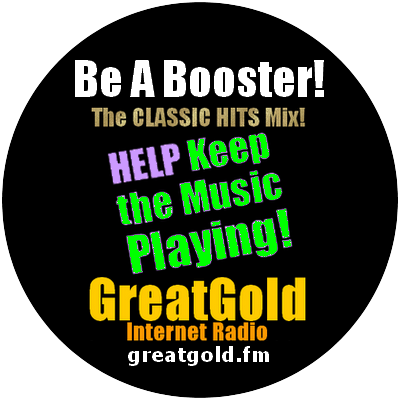 We have been working at getting all of the major internet radio directories and mobile apps, updated, so you can listen in more places than the player on our website at http://GreatGold.fm. Some have already made the change. While not all of the places we were listed at have yet to be completely updated and changed to the new settings, many have already made the changes. Those that now, again, have the internal settings changed to the current settings, have links that connect you to our audio stream again, rather than a message telling you to listen at the Radionomy site, or to install a Radionomy app. Our pages (listed in our website menu) help you go to directories at other sites and apps where you can connect to our audio feed. They are not, necessarily, all updated. It’s a work in progress. We’ll list the updated ones here, so you can go where the audio connection link is already set up properly. RADIO DIRECTORIES: As of today, NOVEMBER 9, 2018, these internet radio directories are working: TuneIn.com, McStreamy.com, StreamFinder, Streema, vTuner (search at VTuner for greatgold) and a few others. See our INTERNET RADIO DIRECTORIES page for links to go to the directory pages at those websites. MOBILE APPS: As of NOVEMBER 9, 2018, these apps have been updated to include GreatGold.fm Internet Radio: TuneIn, NoBex, and SimpleRadio. See MOBILE APPS page on our site for links to download. To install on your phone you must click on the download links on our website after going to our Mobile Apps page using your phone. OUR SITE IS MOBILE FRIENDLY and can easily be accessed online through your phone’s WiFi Connection. Just enter http://greatgold.fm in the internet browser in your phone. A point of information: You can also listen on your phone directly from the player link on our website. WINAMP CONNECTIONS: These sites have currently working links to connect your WinAmp Software to the GreatGold.fm Internet Radio audio feed, as of October 17, 2018: GreatGold, Clik2Go NetRadio, StreamDir. The WinAmp link at GreatGold is under the player on the player page. This StreamDir listing can be found on the second page of the ROCK category. The Clik20Go link takes you directly to the page with the WinAmp connections for GreatGold and a few other stations. LOOKING FOR MUSIC BIRTHDAYS? See the complete list of Singers and Musicians born this month that are getting Extra Plays, due to being born this month. CLICK/TAP HERE FOR CURRENT BIRTHDAY STARS LIST.